Abstract : Advances in surgical simulation and surgical augmented reality have changed the way surgeons prepare for practice and conduct medical procedures. 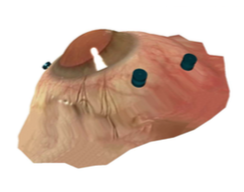 Despite considerable interest from surgeons, the use of simulation is still predominantly confined to pre-operative training of surgical tasks and the lack of robustness of surgical augmented reality means that it is seldom used for surgical guidance. In this paper, we present DejaVu, a novel surgical simulation approach for intra-operative surgical gesture rehearsal. With DejaVu we aim at bridging the gap between pre-operative surgical simulation and crucial but not yet robust intra-operative surgical augmented reality. By exploiting intra-operative images we produce a simulation that faithfully matches the actual procedure without visual discrepancies and with an underlying physical modelling that performs real-time deformation of organs and surrounding tissues, surgeons can interact with the targeted organs through grasping, pulling or cutting to immediately rehearse their next gesture. We present results on different in vivo surgical procedures and demonstrate the feasibility of practical use of our system.